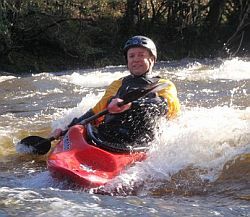 During the winter when the club meeting at the pool, evenings are regularly set aside for Kayak football. These evenings are anounced well in advance and will be posted on the forum and in the events calendar. Think polo but with canoes instead of horses: a game played by two teams in kayaks in a pool with a ball, points are scored by scoring in the opposing team’s goal. 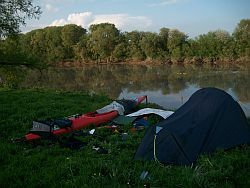 The goal being an upturned kayak but hopefully in the future we might actually sort out (ie make) some real goals. If you cannot handle going over unintentionally then this is not for you!!! 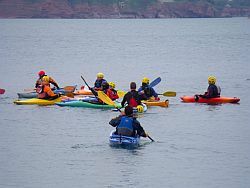 •	Kayak football is a ball game played by 2 teams of kayakers (usually 1 team in orange bibs) normally in a pool. • The game starts and restarts (after a goal is scored) with every player with the back of their boat touching their team’s end of the pool the ball is then chucked into the middle of the pool and play begins. •	If a shot is made at goal and missed and the ball then goes out of play then the defending team gets a free throw from their end of the pool to start the game again. 6. 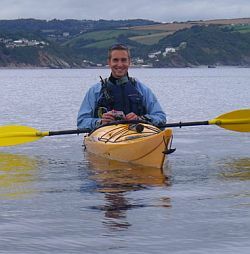 Ram or hit another player anywhere on the body with their boat, paddle, kit or body. 8. Tackle/capsize the opposing team’s players when they are taking a free throw. Should any of these events happen then at the ref’s discretion the opossing team may have a free throw from where the incident took place. 2. Grab any part of another player’s boat to right themselves if upside down. 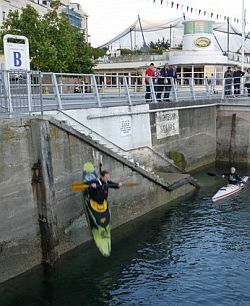 Kayak football is a fun way for paddlers to practice a wide range of skills. 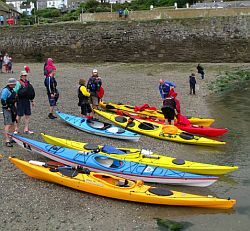 We want it to be accessible to members of all abilities so we ask that more experienced paddlers help in this and 'go easy' on less confident paddlers or those with no roll. If you cannot roll, or really don't want to be deliberately pushed over (when you have the ball), please make this clear at the beginning of the session.